Swiss agricultural policy consists of five main elements. Border protections, market measures, reseach / consulting and advice, financial assistance / grants and direct support. There is also a long list of regulations. The focus of my trip and therefore this blog is on direct support. This blog will look at the policy from the policy maker’s perspective. A later blog will consider the farmer and a subsequent blog will consider lessons for the UK. In 2014 there was a major reform of agricultural policy. A varety of drivers, some environmental, economic, political and external (notably the World Trade Organisation) meant that substantial reform was considered necessary. The subsequent policy runs until 2017 and has a much stronger emphasis on delivering targetted ‘public goods’; meaning environmental, animal welfare and landscape outcomes. So there is potentially much that can be learnt from looking at their policy. As previously discussed, Article 104 of the constitution sets out a ‘multi-functional’ role for agriculture. This includes social, environmental and economic. This is carried over to the structure of the policy, with the five pillars representing different programmes. 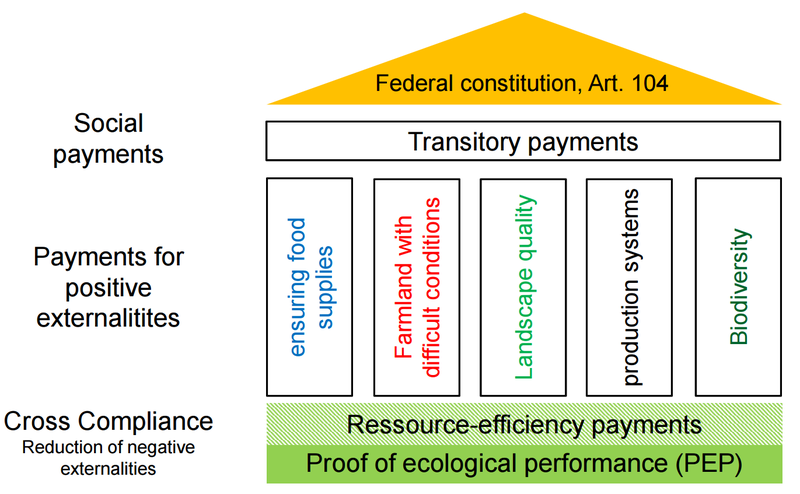 To access any support the farmer must first provide ‘proof of ecological performance’ (PEP). They must also have some agricultural qualifications, be under 65, work at least 20% of the time on the farm and be based in a rural area. Only once those requirements are demonstrated can a farmer access any support. But the support provided is very generous. The total budget is more or less fixed at c£2Bn a year. This budget was the same as pre-’14. 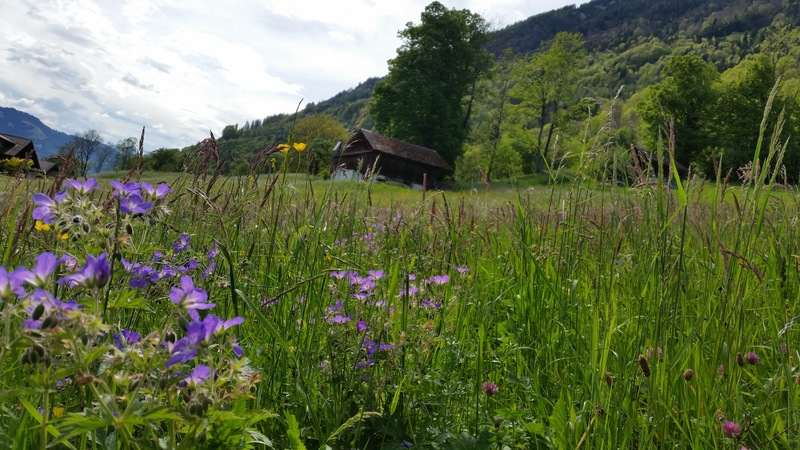 When you consider the UK budget is £3.2Bn and we have approximately double the farmers and over ten times more farm land (almost 20 times when Swiss upland pastures are covered in snow) we can understand how generous the Swiss subsidy system is. The budget is allocated in the following way. Christen Hofer is the Deputy Director for Direct Support in the Federal Office of Agriculture. Here he talks to me about the objective of Swiss policy. This is income support. The objective is to keep farmers on the land and to make farming attractive to citizens of a very rich and well paid country. Subsidies vary based on the region farmers are in and the type of farming. For 14-17 Government increased these payments for arable farmers as they want to maintain or increase self-sufficiency for crop products. Currently they are c50% self sufficient. 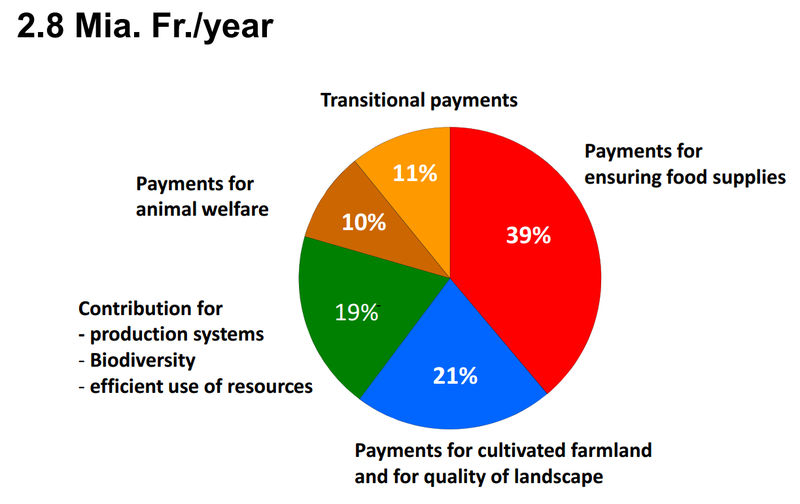 Payments for arable lands can be up to 1,200 Swiss frances a hectare (for permanent crops). At the current exchange rate that is just under £1,000/Ha for meeting PEP. Grassland gets about £650/Ha. The average Swiss farm is only 20Ha so for an individual farmer the total payments are not a high as in the UK but clearly on a acre basis they are much more. In addition to payments for ensuring food supplies there is additional subsidy for those farmers with steep fields. 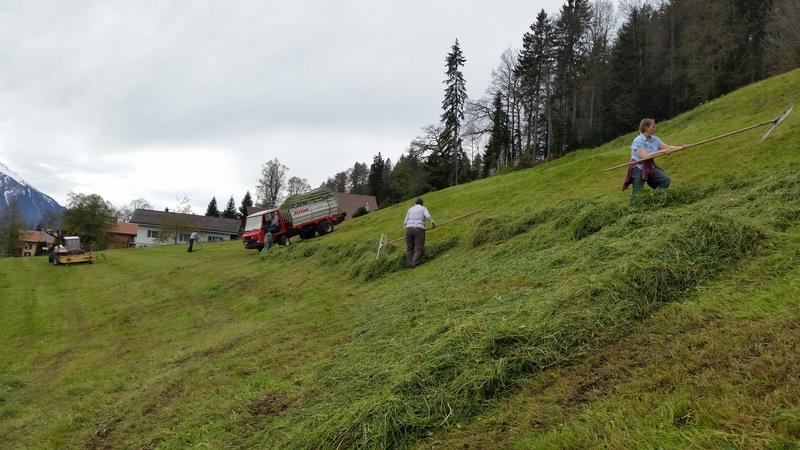 This is not a small section of Swiss farming and much of the moutain region accesses this payment. The last reform saw a shift of this subsidy further up the mountain. Farmers in moutinous areas now get c£700/Ha for maintaining extremely steep slopes. Steep slop management gets c£250/Ha. This is in addition to other subsidies. It was estimated that the reform would through various programmes make up to 3,500F/Ha available to mountain farmers. This is around £2,500/Ha. This was one of the new elements of the 14-17 reform. Subsidies were provided for landscape features. This part of the policy was massively over-subscribed and had to be capped. The main reason for it’s popularity was that money was paid for features that already existed, so it was easy to access. Canton’s have to provide 10% of the funding but they also have a role in deciding which features they want to encourage. Some of the canton’s were reticent to provide the funding but at the local level the farmers unions ensured that the funding was provided so they could access the federal monies. 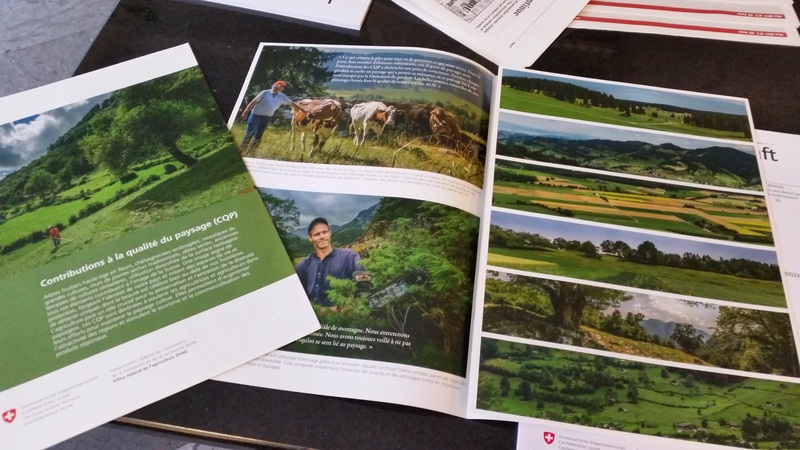 Landscape is a big part of Swiss identity and their tourism industry. This is a wide ranging programme that supports systems such as no-till, organic, grass fed livestock and extenso (which entails growing cereals with no insecticides or fungicides). The programme aims to improve use of fertiliser and other inputs by promoting techniques which are more precise. It is intended that all farmers can access this programme. Interestingly payments are for a fixed time but the activities are expected to continue after the payment period. Payments are provided to improve the quality of the 7% of land managed for biodiveristy (as required under PEP). It is possible to increase this area to the whole farm where appropriate. There are different levels, referred to as qualities. Quality 1 is based on prescription but quality 2 is rewarded for outcomes. Much of these relate to floristic diveristy and farmers get extra money for delivering flower rich meadows or strips. Funding is also available for ‘networks’ these are bottom up projects with more targetted plans for specific species. These are part funded by the canton. In recognition of the scale of reform in 14-17 it was intended that the above programmes would not use all of the money. Rather each year after farmers had applied to the various programmes there would be a surplus and this would be allocated back into the sector based on certain factor. This supplement is in addition to any other subsidies. Over time these payments will be phased away. One of the things that impressed me was the quantified targets that the policy is aiming at (but not always hitting). This is possible when you have a set of well funded policy instruments that cover most of the farmers’ likely activities. For instance previously there were concerns about too many livestock causing too much pollution. Policy makers reduced subsidies for livestock farmers, increased conditions via PEP and they have seen a reduction. It’s not always straightforward though. Removing headage payments was expected to reduce livestock numbers but it lead to intensification with farmers looking to get a better market return from the same stock. This is one of the reasons that they are still a long way off meeting their target for amonia reduction. There is a lot that can be said about these policies but I’ll save that for other blogs and my Nuffield report. Although not perfect it’s worth noting that all the groups I have talked to want to continue the current system for the next round. This includes the farmers union who were initially against the reform. Really interesting and well written blog, well done! Is interesting to look at the results based systems for biodiversity, one question, is there any mention of carbon / GHGs in their environmental programmes?